The APA has lowered the fees for requesting appeal trial greatly in order to make it easier for our clients to proceed to appeal stage. Especially when spending a lot of money and time on foreign filings we believe that it is not satisfying if the patent is not registered. Currently our registration percentage for foreign and domestic filings is 82% in Japan*. In order to increase the registration percentage in Japan we already provide a prior patent search service and a voluntary amendment service. Also in order to further increase the registration rate in Japan we are recommending usage of the appeal trial system. In the recent years in cases where an appeal trial has been requested (including the pre-appeal examination) the patent registration rate was 70%. In Japan it is possible to amend the claims when requesting appeal trial. 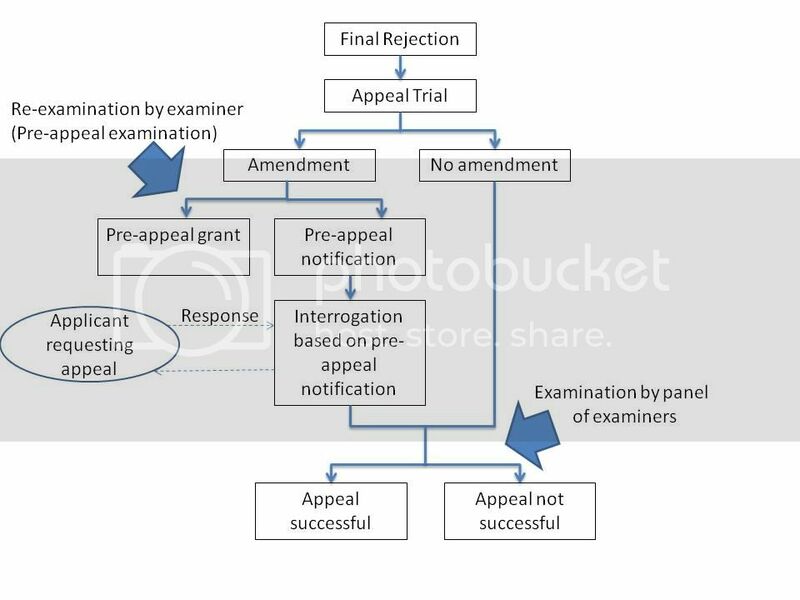 (Pre-appeal examination system) The figure below explains the procedures for requesting appeal trial after a final rejection has been received. To our valued clients that entrusted us with their Japanese filings we want to provide satisfying results by achieving a patent right, so we reduced our fees for requesting appeal trial greatly to the same level as our fees for responding to a regular office action. (New fee system) Like in Japan in Korea as well the patent registration rate for applications where appeal trial has been requested is exceeding 70%. Please take this opportunity to consider using the APA for patent filing and IP matters in Japan, China and Korea. In the next newsletter we will explain strategies for dealing with final rejections in China and Korea. *The registration percentage for Japan reflects the actual results of Tsubame Patent Attorney Firm responsible for Japan. From August 01, 2012 in total 89 of our Japanese filings have been registered and 20 cases have been rejected finally by JPO. The number of rejected cases does not include cases that have been abandoned due to conditions of our clients. The above registration percentages should only be seen as rough guideline.